Right off the bat I knew I was going to enjoy Over the Garden Wall because it looked adorable, and it is. The animation is simple but projected against vibrant and artistic visual backgrounds. The setting helps add to this factor since The Unknown seems to be in the early 20th century era, where the women wear petticoats and the way to travel is by horse and buggy. In one episode Wirt and Greg travel down a dirt road but what really grabbed my attention was the farmland in the background that looked so realistic and colorful with an array of vegetables that were grown in the 19th century. Or the episode where they all sneak aboard the frog ferry and are singing while the sunset appears behind them and it literally looks like there are cartoon characters floating down the Mississippi river. Aside from the stunning visuals of the show, Wirt has to be my favorite part. He is the older brother of the two and definitely takes on the role as the leader and caretaker to Greg. He tries to stay strong throughout their journey but he is a complex young man. He overthinks everything and relies on common sense rather than intuition. Often when thinking about their current situation or being faced with a new challenge, like playing the bassoon, Wirt has to pause for a brief anxiety attack. His character compared to his younger half brothers’ contrasts really nicely to bring about an amusing relationship. He is constantly running after Greg, dragging him to keep up, and getting him out of trouble. The whole time, Greg is in la-la land because he is a young kid and just likes to carry around his pet frog like a doll and toss candy around the forest, which brings me into the humor of the show. Over the Garden Wall doesn’t present direct humor but incorporates a really random and weird sense of humor. The characters don’t tell jokes but what makes the show funny is the absurd things that occur. For instance, this frog that Greg is obsessed with gets a new name every episode and then after six episodes of the frog only saying “ Wuurrtt”, he suddenly breaks out into a beautiful deep- voiced ballad. Then in episode 8, we enter Greg’s dream in Cloud City where he dances and sings while introducing the people of cloud city; the angels and the receptionists, but, suddenly the scene cuts to a hideous beast just staring into the camera before it pans back to Greg and he utters, “ Uhh lets move on”. Its situations like this, in episode 8 or 6, that make viewers think, “What is going on?” but also think its hilarious. All cuteness and fun aside, the show brings up real life issues and discussions. There is the side plot line of the Beast and the woodsman, which brings up morals about doing what is right or wrong and battling evil. The woodsman is stuck between saving his daughters soul and the lives of two innocent boys, Wirt and Greg, who the Beast demands to be captured for him. The woodsman tries to warn the boys and defy the beast but he also does not want his daughters soul to perish. There is also Beatrice’s situation, which says a lot about trust, grief, forgiveness, and learning from your mistakes since she was punished and turned into a blue bird with the rest of her family. It’s completely her fault for having her family ‘s life taken from them and she feels a large amount of grief. She ends up using Wirt and Greg by tricking them into thinking she was helping them when in reality she was bringing them to Adelaide to sell in exchange for her freedom. However, the truth comes out but Beatrice does not go through with it, which shows that she valued their friendship and their lives over her own selfishness. Finally, there is the relationship between Wirt, Greg, and Beatrice that builds and is broken over the course of the show but speaks a lot about relationships in general. They hit a couple of bumpy roads, like when Wirt almost dies or when they find out that Beatrice almost sold them as servants, but they are always there for each other. They are truthful with one another and are always there to help when someone needs it. However, I found Beatrice to have a serious attitude problem. She really annoyed me and got on my nerves especially when I found out that she was tricking Wirt and Greg the whole time. I almost didn’t want to watch some of the scenes that she was in because I didn’t trust her and was not in the mood for her negativity. I know she had a change of heart but she was being selfish towards two lost and innocent boys to save her when it was her fault in the first place that she was turned into a bird. Aside from that, Beatrice was bitchy the entire time she traveled with Wirt and Greg. In Episode 3, Beatrice repeatedly calls Wirt a push over and then again in episode 6, she calls him a loser. I found Beatrice to be irritating but I think she had a clear purpose for being in the show. In the end, she ends up getting past her selfishness and really helps out Wirt and Greg. I also felt that the overarching plot line of the show was unoriginal and overdone. It is very typical of the fantasy and storybook type of stories, like Over the Garden Wall, that two boys wander off and get lost in the woods often running into mythical creatures and adventures to try and make their way home. I think that so many other shows, movies, and plays have used this concept already and though it ends up working well for the show, because of the side plot lines like the beast that’s chasing them, Beatrice’s plot line, or the shocking twist ending of why they ended up in the woods in the first place, it is just a reused concept. The only other complaint that I have about the show is that it is limited with its availability. If someone were to want to watch the show and get into it, they would have a hard time doing so. I noticed that Cartoon Network, or any other network for that matter, do not air Over the Garden Wall often nor is it available to watch on any websites. It is not on any paid television networks like HBO or Netflix but is only available upon purchase or an illegal download. I had to watch the show, from a link provided by a classmate, which was sufficient enough but I worried about the safety of the site and the quality was sub par. 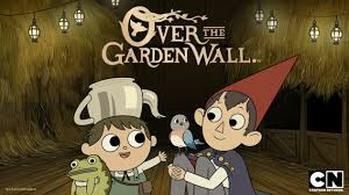 Overall, I enjoyed Over the Garden Wall and found it to be a show that I could easily start watching. Its adorable, has an intricate plot, and just the right amount of odd humor to keep you giggling throughout. It’s more geared for kids but adults will still be able to find the presentation visually stunning, the characters adorable, the situations hilarious, and the plot always taking twists and turns.